FOR THOSE WHO ARRIVE LATE IN ATHENS AND WANT TO GET TO VOLOS: There are two trains with sleeping compartments ONLY that leave Athens at 23:17 and at 23:55. They go all the way to Thessaloniki, but at least you can sleep in there until Larissa. The first one gets there (in Larissa) at 4:12 am and the second at 4:59. People usually book them in advance,... There is a pretty good waiting room at the railway station in Larissa where you can spend the time until daybreak. Then you can catch the first train from Larissa to Volos at 6:35 arriving in Volos at 7:37. IF you have booked your hotel for the 24th and need to get to Volos on the 24th, you can also take the bus from the "Liosion bus station". There are no means of public transportation to get you to that station, so you will have to get a taxi from the center of Athens. The last two buses leave at 19:30 and 22:00(the last) and the ride is 5 hours. There are taxis outside the bus station in Volos that can take you to your hotel. ADVICE: Go to the train station first to find out if there are beds available on the trains. If not, take a taxi to the bus station, which is not that far away. Fly to the new Athens International Airport (A.I.A. ), ELEFTHERIOS VENIZELOS. This is the HCAA link to the Athens International Airport. 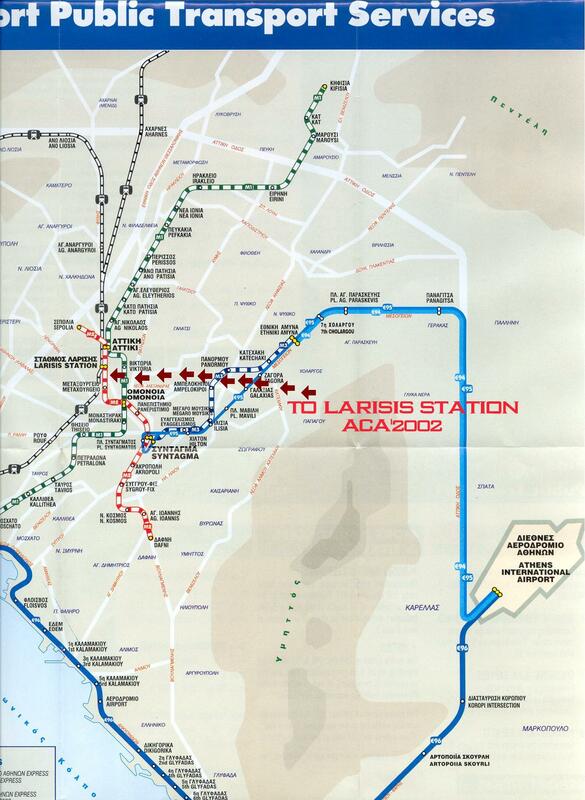 To go to the train station from the Athens International Airport, take the metro and get off at metro station called "Larissis". there are 2 direct intercity train connections to Volos daily (at about 10:45am and 3:45pm). You can catch the intercity train at the metro station called "LARISIS STATION". The train station is across the street from the metro station called "LARISIS STATION". any other intercity train going north (Athens-Thessaloniki), is also suitable to take you to Volos but you will have to change trains in the city of Larissa. From the city of Larissa there are direct connections to Volos every hour. The last train from the city of Larissa to Volos is at 10:00 pm. 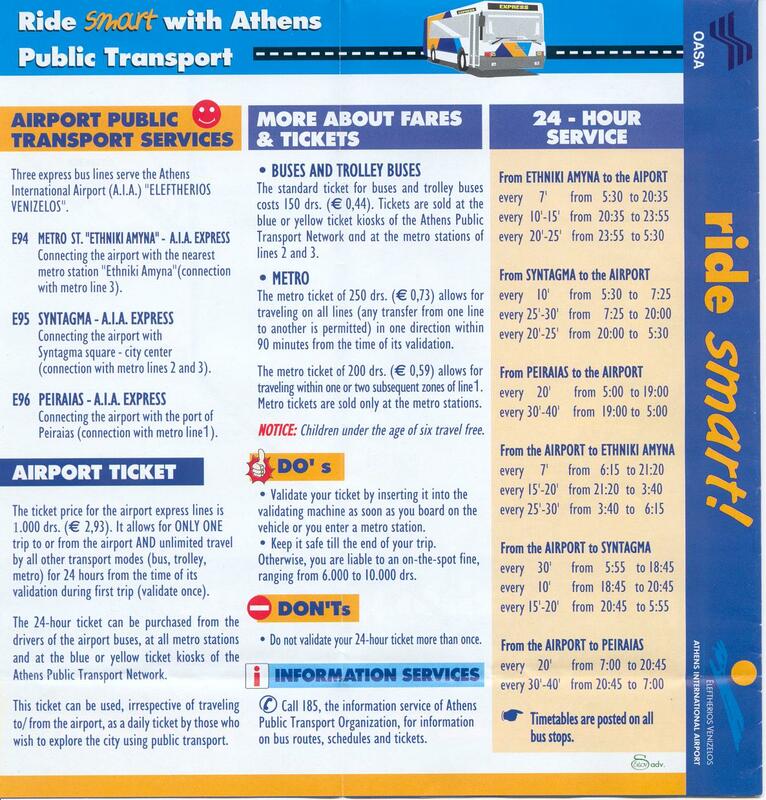 Note 1: At Athens International Airport you can buy an 1-day pass for E2.93 valid for 24 hours in all buses and metro lines. You can also buy this 1-day pass at any metro station. Note 2: Train schedules can be found at the OSE website. Note 3: It is cheaper to buy a return ticket Athens-Volos & Volos-Athens, than an one-way ticket Athens-Volos, if you plan to return to Athens after the conference. Note 4: The trip from Athens to Larissa by train is about 4 hours. The trip from Larissa to Volos is about 1 hour. take a bus from Athens to Volos. The name of the bus company is KTEL. Fly to the Thessaloniki Insternational Airport, MACEDONIA. This is the HCAA link to the Thessaloniki International Airport. either take the bus (Public Service no 78, every 30 min, fare E0.42, journey time 30 min) and get off at the Bus station "New Rail way station"
there is one direct train connection to Volos daily (at 19:23 pm - arrival time 22:57 pm). You can catch the train at the New Rail way station. The train station is just next to the Bus station. any other intercity train going south (Thessaloniki-Athens), is also suitable to take you to Volos but you will have to change trains in the city of Larissa. From the city of Larissa there are direct connections to Volos every hour. The last train from the city of Larissa to Volos is at 10:00 pm. take a bus from Thessaloniki to Volos. The name of the bus company is KTEL. 100 (Police), 199 (Firefighters), 166 (Ambulances).